I came across this nice gem with the monthly deliveries of my Good-being goodie box. If you’re not sure what Good-being is, it’s a monthly delivery of beauty products that are more health conscious and less harmful ingredients. I figured I would try this and see how it worked with my clients on set! I used it when I was working with my bridal/ event clients and they loved it! 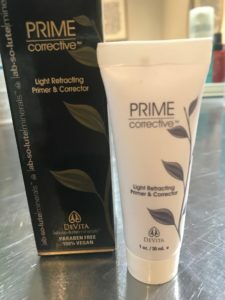 They said their makeup held up nicely and never got oily!I was impressed with the results and I even tried it on myself and liked the way my skin looked with the primer. What’s nice about this company and this product is they are vegan, phenoxyethanol free, toxic- chemical free, no synthetic fragrances, free of parabens, sulphates, glycols, PEG’s, petrochemicals and gluten-free and does not support GMO’s. This gel is lightweight and has the ability to create a beautiful, natural- matte finish on the skin to hide any imperfections or larger pores and to help support your skin while wearing makeup. This feels so nice and smooth on the skin. Some of the ingredients are lavender, vitamin e, vitamin c and some marine algae. Lavender is calming to the skin, vitamin e is nourishing and the vitamin c helps with free-radicals and marine algae is so good for the skin. Algae can add hydration, deliver more nutrients into the skin and help make the skin more supple. I know it’s a lot to remember what to avoid in skincare and makeup products. If you can be open to learning a small amount at a time, over time… it won’t be so overwhelming. It’s nice to see that companies are paying more attention to our health and making cleaner more health-conscious products. I love that we are seeing more options and new product developments! I will def be adding this to my professional kit for my brides and event clients! I may also want to check out their skin care.